Fun's over, folks - Google appears to have put the price back to the standard $28.99. Well done if you managed to grab it for free. Free stuff is free stuff, no matter what it is. All the better, then, when you like what's being offered. 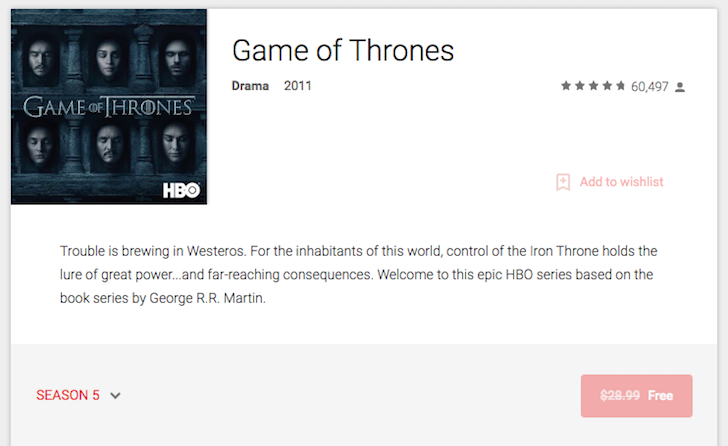 In this case, Google Play is offering HBO's Game of Thrones season 5 in standard definition, which should please a large proportion of people. Game of Thrones, the TV adaptation of the popular novel series, A Song of Ice and Fire, by George R. R. Martin, will surely go down a treat with Google Play shoppers in the US (sorry, everyone else - it looks like you're out of luck here). The minor quibble is the SD qualifier - it surely wouldn't cost Google or HBO any more money to make the HD version available - but that's the only thing. Game of Thrones for free is stupendous, whichever way you look at it. If you're interested, hop on over to Google Play and grab this deal before it reverts to normal price. Unfortunately, it looks like this is only available in the United States, but do let us know if you're seeing it as well where you are.